Not only is this variety beautiful and colorful, it is also ideal for planting in containers, small gardens and the edible landscape. 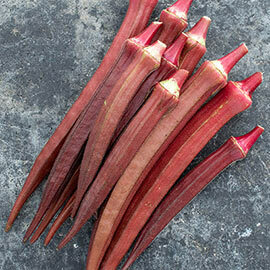 Dwarfed plants grow just 24-30 inches tall and produce 3-5, pink-red pods at a time. Plus, when picked regularly, French Quarter just keeps producing. For maximum flavor and best texture, pick these unique pods when they are 3-4 inches long. Excellent roasted, grilled, tossed in stir-fries, and in gumbos and jambalaya. 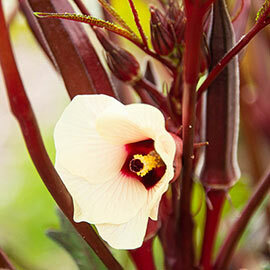 This hybrid okra can also double as an ornamental. It features an open, compact habit with lovely foliage and soft yellow flowers. For best results, sow okra seeds in a sun-filled location when the weather is warm and after all danger of frost has passed. 50-55 DAYS. Fruit: Pink to pinkish-red fruits are best when picked at 3-4 inches long.